Established in 1940, Wauwilermoos Military Prison was located in Lucerne, Switzerland. The prison held many nationalities, as Switzerland hosted military refugees of virtually all the belligerent countries in Europe. Surrounded by several rows of barbed wire, the compound was patrolled day and night by armed sentries with guard dogs. The barracks were wooden single-wall construction, and prisoners slept on boards covered with dirty straw. Lice and rats also inhabited the barracks. At times the latrines consisted of slit trenches inside or outside of the barracks, and no hygiene facilities except the chance to be hosed-off every few weeks. Food was poured from slop pails into troughs or tin pans. Internees lacked medical care, proper nutrition, or access to any mail or aid parcels. Prisoners who remained in Wawilermoos for extended periods emerged severely underweight, and covered with boils or other ailments. American internees were often sent to Wauwilermoos with little due process, and trials were conducted on them in absentia. 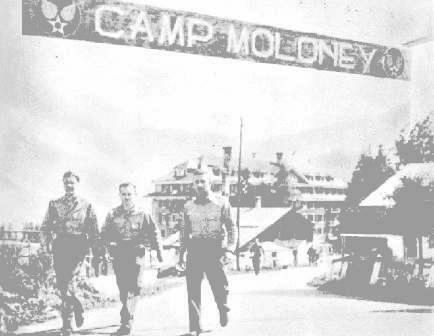 The airmen were kept there indefinitely until the U.S. Legation and the U.S. State Department lodged formal protests to the Swiss foreign minister in November 1944. Although the International Committee of the Red Cross (ICRC) inspected the camp on a few occasions, headed by Swiss Army Colonel Auguste Rilliet, the inspection team simply noted that sanitary conditions could be improved, and prisoners were not aware of the length of their sentences or why they were in the camp in the first place. Only just prior to the removal of the commandant in 1945 did Rilliet find the camp conditions unsatisfactory, in spite of the fact that Wauwilermoos was the subject of official protests by the United States, Great Britain, Poland, Italy, and prevented normalization of diplomatic relations with the USSR. This may have been due to a secret agreement between the ICRC and the Swiss Army, which gave the Swiss Army permission to review and censor inspection reports prior to their release to foreign powers. Numerous Swiss citizens reported that the conditions at Wauwilermoos were in violation of the 1929 Geneva Conventions, including a Swiss Army medical officer, an officer on the Swiss Army's General Staff, and the editors of two Swiss newspapers. The commandant of Wauwilermoos was Swiss Army Captain André Béguin. Although serving in the Swiss Army, Beguin was also a Nazi sympathizer, as member of the National Union who previously lived in Munich, Germany. He was known to wear the Nazi uniform and sign his correspondence with "Heil Hitler." He was given his command at Wauwilermoos despite his prior dismissal from the Swiss Army in 1937 for financial fraud, various confrontations with the police, arrest for wearing a Nazi uniform in Switzerland, and investigation by Swiss counterintelligence for his pro-Nazi political views. While in command, Beguin publicly bereted Americans, sentenced them to solitary confinement, and denied Red Cross parcels and mail. In 1946, Beguin was court-martialed in a trial that lasted 149 days. He was convicted of administrative misdemeanors, dishonoring the Swiss and her army, embezzlement, and abuse of authority. In its decision, the court described Beguin as a "crook, embezzler, con-man and inhuman." Beguin was sentenced to several years of inprisonment, fined, and stripped of his civil rights. The U.S. War Crimes Office also collected multiple war crimes accusations against Beguin, but the Allied powers never attempted to prosecute him due to lack of jurisdiction.